Our team revamped this washroom with our BrightWall System, the panels make the room cleaner, brighter, and more appealing to the eye. This homeowner had several sinking slabs that surrounded their home, some were actually a tripping hazard for this family. They called Ohio Basement Systems and we fixed the problem areas with our PolyLevel System. In these photos you can see how low this slab had sunken down from the home and the drastic improvement that was made with PolyLevel. We were able to finish this basement into multiple area's including a winebar, bathroom and entertainment area. Remodeling basement and would like a quote on replacement of sump pump with new pump that has emergency back up system as well as improvement to the well lid if possible to reduce noise as basement will now be used as living space. Recently noticed a small crack with slightly bowing. Basement walls need looked at...cracks, etc. End of driveway has a slab that needs to be leveled. Polite and upfront and honest. Kevin was great. He explained everything and took his time to answer all of my questions. Tony awas amazing, he and his crew are very hard workers and explained everything. Very professional. When they left it looked like they were never here, AWESOME JOB! Ohio Basement Systems is the best company for the work I needed to be done. The whole process from start to finish was a great experience. Ron an his crew did a wonderful job. We felt everyone from the consultants to the crew who fixed the basement were professional and we were very satisfied with everything. "Good People- Excellent workmanship. Great Job." "Polite, upfront, honest. They redid some of the items I..."
"Everything went well from the 1st contact through the job..."
Ohio Basement Systems is the local contractor you can trust for all your basement, foundation, and crawl space repair needs! Our team of expertly trained technicians use only high quality materials and products to ensure lasting, warrantied results. We can give you the peace of mind that comes with having served the Ohio area since 1999 as well as methods that have stood the test of time. Trouble with a wet basement can be caused by a variety of things including leaky pipes, sump pump failure, or flooding during heavy rain. These problems can have catastrophic consequences for your home's foundation and overall structural integrity if left unchecked. Some of the major symptoms of a waterproofing problem are musty odors, condensation, puddling of water on the floor, and crystaline deposits on the floor. The best way to combat these issues is to install a quality sump pump to get water out of your basement and then keep it dry. We use the TripleSafe sump pump system which is unique because it has a primary pump, a secondary pump, and a battery back up pump so you can be extra sure that your basement will stay dry, even if the power goes out. Our waterproofing techniques have stood the test of time, so you can be confident that they'll keep your basement dry. Foundation problems can stem from a number of areas, but are most often caused by poor, weak soil that can no longer support the weight of the house, and thus allows sinking. The major signs of a foundation problem are sinking, cracked floors, cracked walls, cracks around windows and doors, and bowing, leaning walls. At Ohio Basement Systems, we have the tools to fix these problems permanently so we can get you back to enjoying your home. We use wall anchors and I-Beam wall braces to repair and correct walls that are bowing and leaning. Our foundation and slab piers can be installed to correct sinking floors by finding areas under the bad soil that are strong enough to support the house's structures. 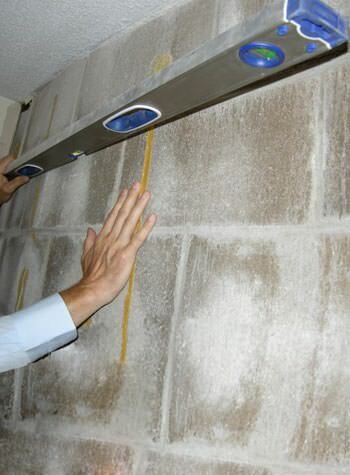 In addition to our foundation repairs, we also offer concrete leveling using the PolyLEVEL concrete lifting system. If you have a hazardous sidewalk or patio because of sunk in concrete, then we can fix using the quick and easy PolyLEVEL technique. The PolyLEVEL solution is injected under the concrete slab until it is the appropriate height - problem solved! There is no need to replace the whole concrete slab and unlike other solutions, PolyLEVEL uses an injection hole the size of a penny and only takes 15 minutes. Another simple, clean concrete repair solution Ohio Basement Systems offers is our incredibly durable concrete sealant, SealantPro. In just one application, SealantPro increases your slab's life by 3 to 5 times overall and provides long-lasting protection from oil, gasoline, water, as well as other debris and liquids! Though one of the more neglected areas of the home, a damaged crawl space can cause problems in other areas of the house and, in severe cases, pose a health risk. Things that often cause disrepair in a crawl space are water damage and a buildup of debris left over from the original construction of the house. These problems can be easily solved by installing our state-of-the-art products that are proven to keep your crawl space dry and energy-efficient. We can install our quality vapor barriers which seal out moisture and bugs and keep good air in. Our dehumidifiers will help cut down on humidity to ensure a dry space while our thermal insulation will make your crawl space an energy-efficient part of your home, rather than a health risk. Ohio Basement Systems is the dependable contractor that has been proudly serving Ohio for over a decade. 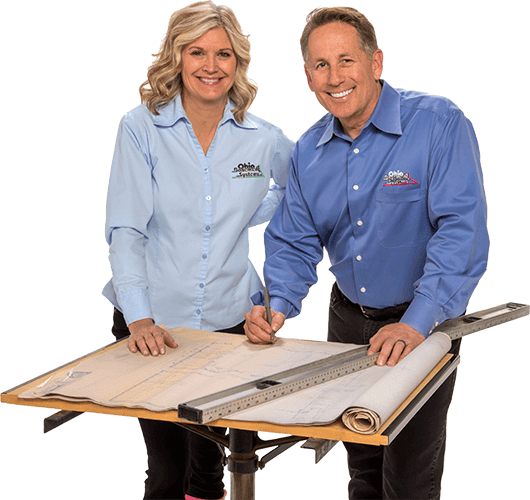 Let us put our expertise to work for you to find a solution for all your foundation, basement, and crawl space repair needs. Our friendly, knowledgeable staff and qualified technicians are ready to work with you, so give us a cal today for a FREE estimate! Now this homeowner has beautiful, spacious closets. Lighting, doors, and the walls are now finished. Lovely, dark Mill Creek flooring. My basement is leaking excessive amounts of water. I have a sidewalk to the house. 3 slabs out of 5 have sunk causing a trip hazard (about 1/2-3/4 inch). Slabs are not broken. Sidewalk runs over top of the sewer line of the house. House built in 1999. Ground beneath sidewalk settled. Would like an estimate please. Moisture, mold, foundation, block step cracks. There's some leaking on the south side of the basement wall. Having problems on 1 wall of basement. Leaking and cracked. Possible sagging floor joists in crawl space. Hello, My husband and I have been seeing water and dampness in our partially finished basement. We had removed some of the paneling and discovered mineral deposits on the stone and a crack in the wall. There was also some dampness around the perimeter of the one wall. We just need an estimate and an inspection to see what the problem is and how it can be repaired. Thank you. Concrete wall in basement is bowing in...this is a ranch home built in 1970. My sidewalk to the front door of my home has settled and needs lifted.